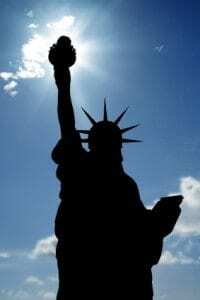 The process of becoming a citizen of the United States is called naturalization. When you become a United States Citizen, you gain many important rights including the right to vote in Federal elections. A United States Citizen may petition for an immediate relative (such as a parent, brother or sister, spouse, or child) to come to the United States and become a permanent resident (also called a “Green Card”). A Permanent Resident can petition for a spouse or unmarried child. An unmarried United States Citizen may petition for a K-1 Fiance Visa. Proof of a bona fide relationship and intent to marry is required, and once your fiancee enters the United States you must marry within 90 days. If you already married outside the United States and wish to apply for your non-citizen spouse to enter and become a Permanent Resident, an Adjustment of Status is necessary instead. A foreign national who has entered the United States lawfully and wishes to remain permanently may, if they qualify, petition to change their status to Permanent Resident. A foreign national who entered the United States unlawfully, who has a qualifying United States citizen relative, and who meets other additional qualifications can petition to adjust their status. Also called DACA, some individuals who entered the United States as children, have continuously resided in the United States since 2007, are in or have completed school, and meet other qualifications can gain permission to remain in and work in the United States. Most of our immigration services are provided for a reasonable flat fee based on the type of service and complexity of your individual case. Fees are quoted at the initial consultation, and agreed upon in writing and paid at the beginning of your case. Mr. Eggert is actively licensed to practice law in Hawaii, Oregon, Washington, Utah, and is eligible to appear in the Executive Office for Immigration Review (EOIR, aka “Immigration Court”).